We are here to help you solve your problems! Comment form validation creates a friendly user experience. When using the default wordpress comment system, if the user doesn’t fill out all the require fields, they are redirected to a new page displaying an error message. The user now has to press the ‘back’ button in their browser window and they may or may not lose information they have already entered in. To solve this problem, i’ll show you how jQuery can be used so comment form errors are displayed to the user without leaving the page. To keep the page loading times fast, we are going to use the minified versions of jQuery and jQuery Validate from the Google and Microsoft CDN servers. Let’s only load the required code if any single post is being displayed – and if comments are open. comment: "Message box can't be empty!" Now let’s go over the code and it’s options. This enables “real time” validation. If you prefer to only validate -after- the user clicks on the “Post Comment” button, just remove that entire section. Author – required field with a minimum length of 2 characters. Email – required field with a valid email address. Comment – required field with a minimum length of 20 characters. They can easily be adjusted to anything you want. Change “true” to “false” to remove validation for any field. The “normalizer” option in the rules section is used to trim any whitespace from the user input. This way, for example, (20) white spaces for a comment won’t validate. The form field is not vaild. The user does not fill in the required field. The errorElement option sets the error message to be displayed in a html <div> section. 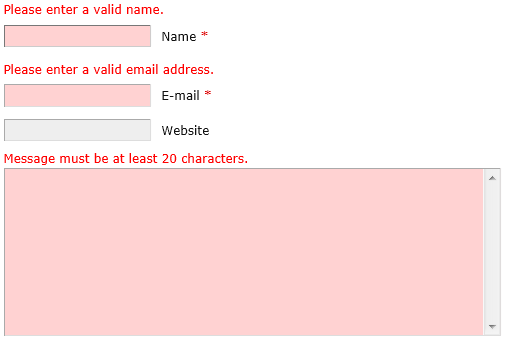 This is done so the error message doesn’t mis-align any of the form boxes. The errorPlacement options sets where you want the message to be displayed. It’s currently set to display the message -above- the invalid form element. That’s it! You now have a lightweight jQuery comment form validation that works for Microsoft Edge, Internet Explorer, Firefox and Google Chrome. Let me know in the comments if this has helped you out and if you would like a jQuery tutorial on something else! Thank you very much for the tutorial. It helps me a lots. Thanks for the tutorial, it was exactly how I wanted to implement jQuery validate into WordPress! Thanks for the tutorial,.. I did extraly what you have here but my page won’t use the css for the class “error”. The error message switched to the top of the elements of my form but the letters remain grey . Any help would be appreciated. By the way, I am using bootstrap with a WordPress template. Thanks for the quick response Dave. I was able to make it work and actually what I needed was to clear the cache of my browser lol. Can this also work for multiple forms on a page, if I give each form a different id? Or what do I have to do to make this work? Ok, thank you but how can I do this if I give each commentform the ID of the PostID, like #commentform1022 for postID 1022 and for example #commentform1038 for postID 1038 and so on…. There can be many commentforms on a page which all get the ID of the posts on that page! This worked great on the single page but not on a custom post page that I aded a loop and the comment form to. I took out the is_single conditional. Is there something else that I’m not considering? Thanks for this. @Amelia – You can try this (from the WordPress codex) : To check for all the post types, use the is_singular() function. So just replace is_single() with is_singular(). This is amazing Dave, i hated the default error display by WordPress. Am smiling as it saved me a lot of time, keep up cheers! to the validate() call. Also, my knowledge may be incomplete, but why not add this to a js file instead? I’ve done so and it seems to accomplish the same result with the advantage of being tidier. I used it. It’s work’s fine , thanks a lot. “The error message mis-align the form boxes.”– I was trying to fix this for the long time.. Thanks a lot for your post . thank u very much ……i get my result today…….. This was very helpful and easy to implement! Not sure why this isn’t the default for WordPress. Such a bad design to bring the user to a new page to display form errors. Wow! so simple! thanks a lot! Hey …. thanking you …. thank you very much.. You saved my lot of time. Hannon, thanks for this code and this is what I want. One more feature that I want, how to check captcha validation with you code, I know the condition for blank captcha field validation but what about if the user can add the wrong captcha, is this possible to check wrong captcha validation with your code. @Nimesh: no, I don’t believe that’s possible. ok no problem, and again thanks for this validation help. I’ve updated the code so it uses the latest versions of jQuery and jQuery Validate + modified the code so it does validation in real time. If you do not want to validate in real time, simply remove the “onfocusout” section – then it will only validate after you press the “Post Comment” button. The above code works very well. But I need help in validating Mobile Number field. I have created a new field – Mobile. It has some regex format say /0,1[1-9]/. The above code you gave is not validating this newly created field. Can you help me to solve this? I added, but its worked fine in Firefox but other browser it’s not over written. It work different in different browser. Is it depend on browser? @Halder – Which browser is it not working on for you? I just tried IE, FireFox, Chrome & Edge and it’s working fine here. I added it into functions.php file. But it’s not working any browser. What happen i don’t understand. Please Help me. I change only errorElement: “div” to errorElement: “p”. @Debasish – why did you change the errorElement? It needs to be a “div” or things will get mis-aligned. @mlll – no, it works in any browser. You probably need to clear your temporary internet files and refresh the page. thanks its work for me ! its amazing. @rose19 – The entire code needed for this to work is listed at the top of this page. I paste the code at the top of this page into the function.php.. but what i’m writing in my form (html)? @rose19 – You don’t write anything in your form, all this code belongs in your function.php file and css file (for styling). Thanks Dave…it was very helpful..saved me a lot of time… gracias amigo..!!! I am very to implement your code and it works in first time. Good Job. Thanks. You need to add a normalizer to the comment rules section. The normalizer will trim the value (get rid of the white space) before validating. I’ve updated the article with this new code + the new jQuery Validation version link. Thank you for sharing this! I spent hours trying other suggestions, but some didn’t do quite what I wanted, and others didn’t work at all. A more knowledgeable person probably could have made them work, but I needed a solution that worked without much tinkering on my part. This one is perfect, and no tinkering was required at all! It seems I spoke a little too soon. The validation works great, but I will need to do a little tinkering. Now the background color of the form shows for just a split second in the input fields, too. Also, there’s a small jump when the error message goes away as the user is typing. Still, this validation is lightyears better than WordPress’s ugly error page. Can you provide me a link to your blog so I can have a look at what is going on? Thank you so much for the offer, but it turns out that the background issue wasn’t related to your code. It does it at certain times, and I just hadn’t noticed it before. Sorry for the false alarm. No problem! You may want to try different a web browser(s) and see if the issue persists. I’ll update the post with the new URL’s later today. Save my name and email address for the next time I comment.